This file bookcase offers a combination of enclosed storage in the form of a hanging file drawer, to help you stay organized, as well as four open shelves to provide you with plenty of space to show off your favorite books, accessories, or photos. 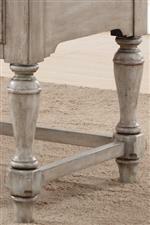 Finished in a distressed graywash finish for plenty of personality and complemented by a medium brown backing results in a gorgeous cottage style piece. The Plymouth Cottage File Bookcase with Four Open Shelves by Flexsteel Wynwood Collection at Great American Home Store in the Memphis, TN, Southaven, MS area. Product availability may vary. Contact us for the most current availability on this product. 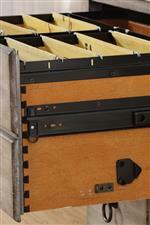 Storage One drawer with two rows of hanging file storage as well as four open shelves. Construction: Case Quality wood veneers over solid Acacia woods. The Plymouth collection is a great option if you are looking for Rustic Relaxed Vintage Cottage furniture in the Memphis, TN, Southaven, MS area. 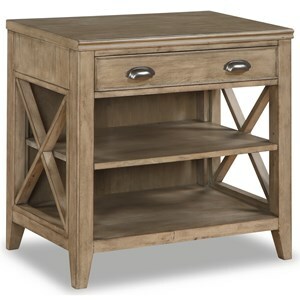 Browse other items in the Plymouth collection from Great American Home Store in the Memphis, TN, Southaven, MS area.